Warren Goodman creates larger-than-life, richly textured paintings that bridge landscape to abstraction and back again. These colourful and deeply intuitive works are a reflection of the artist’s passion for the outdoors. Painting alongside Gordon Smith, Goodman has developed a distinct and mature style that evinces a command over the art of painting. Minute and exquisite brush strokes are complimented by sweeping and bold washes of colour. With a lurid and delicate hand, his renderings of the British Columbia landscape are lucid images that foreground the way in which we see, perceive and understand the natural world. Sharon Quirke is committed to exploring the relationship between Canadian landscape and Canadian culture. Her quest to record the gifts and needs of the people of Canada in the context of the beauty and demands of their land is as dogged and passionate as any pioneer’s. Sharon Quirke’s work is recognized as unique and vibrant. Warm, golden light and bold brushstrokes make her canvases inviting and dramatic. The work is represented in galleries, numerous private and corporate collections, exclusive resorts (including Sea Lion Resort – Sonora Island), and provincial and territorial museums. 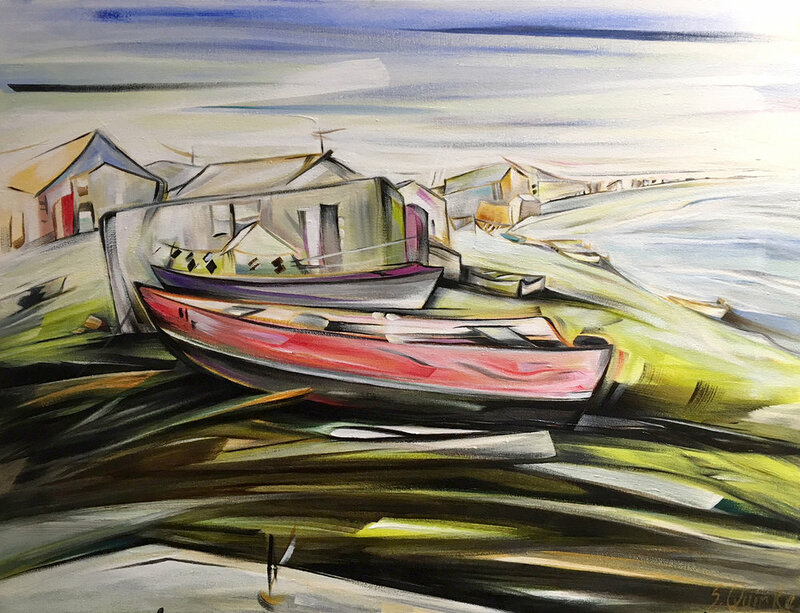 Locally, her paintings are installed in the lobby of 1000 Beach in False Creek, the Purdy and Koerner Pavilions at UBC, DBM Canada, Harmac Pacific and ICBC head offices. Her work has been featured and reviewed in national and western art magazines. Sharon’s recent trip to New York City to revisit her old neighborhood and childhood home is inspiring a new architectural series. Her stroll through the Chelsea Gallery District was an artistic “shot in the arm”! In 2008 - 2009, she established business in the Rockies, as well as on the coast. Sharon Quirke was born in Vancouver. She grew up on the Canadian north coast in Prince Rupert, and later on the American east coast in New York City. She has taught and studied in schools and universities across Canada. After completing a BA at UBC and a Teacher’s Certificate at SFU, she taught in B.C.’s Okanagan Valley. She then studied in Montreal at Concordia University with artists Irene Whittome, Guido Molinari and Charles Gagnon. She completed an MA in Art Education while teaching at the University. In the early 80’s she returned to the lower mainland and began her painting career. She has lived with her husband and family of three boys, taught and painted in West Vancouver since 1984.